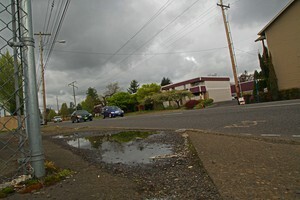 by Amelia Templeton Follow OPB April 23, 2014 2:14 p.m. | Updated: Feb. 18, 2015 8:03 a.m.
Like much of East Portland, the Rosewood neighborhood lacks sidewalks along some stretches of main thoroughfares (file photo). Wednesday on the history of services in East Portland, a collection of neighborhoods roughly bounded by the Columbia River, 82nd Avenue, and Johnson Creek. 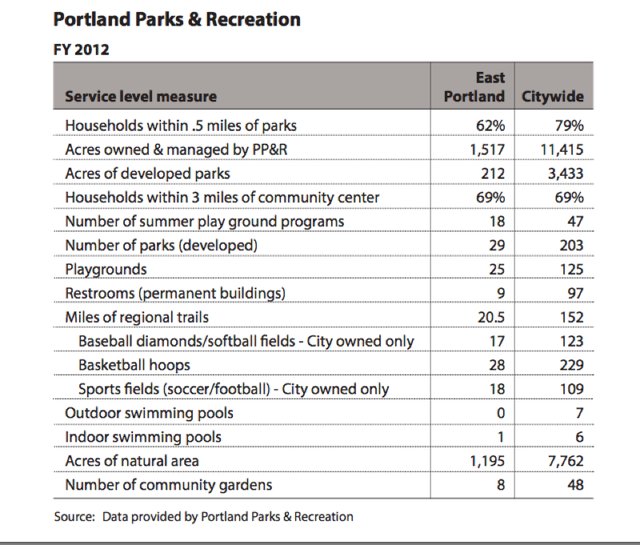 The audit found that residents there are less satisfied with their streets, parks, and water services than people in other parts of Portland. The audit also confirmed that infrastructure and services in East Portland lag behind other parts of the city. 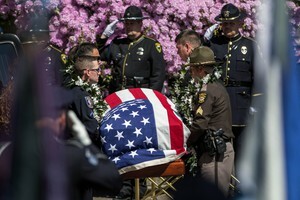 For example, more than 40 percent of the busy streets in the area have partial or no sidewalks, and more than 40 percent of the fatal traffic accidents in Portland happen in the neighborhoods east of 82nd Avenue. Residents are also less likely to live within walking distance of a park. A recent OPB series and tumblr explored how these differences affect East Portland’s youth. Like much of East Portland, there are many unpaved streets in Rosewood.